Dense flocks of Golden Plover and Lapwing were roosting, and alternating between unremarkable under overcast skies and stunning whenever the sun broke through the cloud. They repeatedly flushed in panic and a Sparrowhawk eventually revealed itself as the cause of their consternation. Once that had gone they settled back down before taking off again, this time deserting completely as a large falcon came through. Maybe a Lanner, maybe a Gyr x Saker hybrid, whatever it was it was big and the waders were really not happy about it. We’re moving to the time of year when male ducks start to out on their finery and Mallard, Wigeon, Teal, Goldeneye and Tufted Duck were looking very smart as a Long-tailed Duck played hide and seek with us. Among a group of Common Snipe roosting close by a Jack Snipe revealed itself with rhythmical bobbing before it shuffled off and out of sight. After collecting John and Dani from Hexham we headed to The Battlesteads; our base for the next three days. Saturday’s evening session at the observatory featured some clear sky and we managed a quick binocular tour of Orion, Leo, Gemini, Cassiopeia, Auriga and the Plough before the rain eventually drove us back to the warmth of the dry room. Today was our inland wildlife/landscape photography day and we headed south into the North Pennines. The road sides still had a fair amount of snow and a couple of the minor roads that we would have used to cross some of the higher hills weren’t safely passable but a brief detour soon had us next to flocks of Lapwing, Starling and Common Gull. Red Grouse were their usual obliging selves, sitting well within camera range and chuckling away at us before delivering an ominous ‘go back, go back, go back’ – perhaps they’d had a look at the road conditions already? The avian specialty of the hills was there in good numbers too; 51 Black Grouse during the day included a single flock of 40 birds before drizzle and fog closed in around us. Flocks of Rook and Jackdaw flew in front of us on their way to roost, dark birds against a darkening sky as the weather followed us down from the hills and we headed back to civilisation and The Battlesteads. As I drove to Newbiggin on Sunday evening the rain was hammering against the windscreen but away to the west I could see the weather starting to clear and, by the time I collected Nazarra, Venus was shining bright against a dark blue background. Patchy cloud revealed most of the sky at various points during the evening, and the only real weather we had to contend with was a bone-chilling breeze. After a good look at the Orion Nebula (M42), Pleiades (M45), Andromeda galaxy (M31), Orion, Taurus, Gemini, the Plough, Cassiopeia, Auriga and Sirius, Nazarra mentioned that she hadn’t photographed the night sky but was keen to learn how to do that. Choosing camera settings that would be appropriate for a widefield starscape, Nazarra pressed the shutter release as I held the tripod stable against the breeze. That first shot looked rather orange but I couldn’t see any low cloud that would reflect light pollution…a quick change of the white balance setting did away with the orange glow and the next image had a trace of the Milky Way visible 🙂 With the cloud clearing further, the Milky Way came into naked eye visibility and several sections of the sky were imaged before it was time to return to Newbiggin. 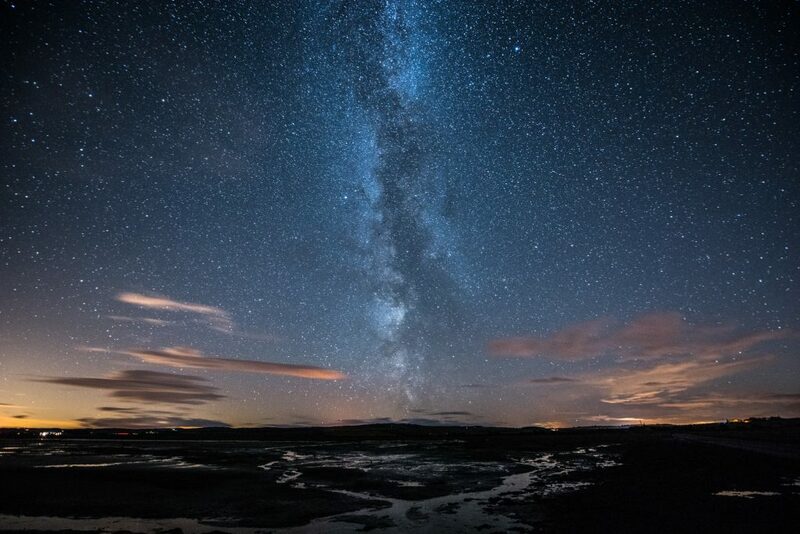 Here’s the Milky Way from the Holy Island causeway last September. One of the great joys of being a dark sky guide is using good optical equipment to allow participants on our stargazing sessions to see detail in things that are only visible to the naked eye as points of light. Venus and Jupiter were obvious in the twilight, and Sirius had vanished into the murk just above the horizon to the south, when Jane arrived for our Discover Stargazing session. Sarah and Jodie arrived a few minutes later and we began our exploration of the night sky, starting with the Moon and the two impressive clusters in Taurus, the Hyades and the Pleiades. Using pointers, particularly in Cassiopeia and The Plough, to locate other objects in the sky is always good fun and lets people start to make sense of what can often be a daunting amount of stars when it’s a clear evening at a good dark sky site, and the number of satellites passing over comes as shock to everyone, but the real star of this session was Jupiter. The fourth brightest object in the solar system, more than 300x the mass of the Earth, taking nearly twelve years to orbit the Sun and with a surface temperature of -108C, Jupiter is an impressive planet. Without going to extreme magnification we could still see bands on the surface of the planet and three of the Galilean moons. Hard to believe but, including the four Galilean moons that are large enough to be seen through binoculars or a telescope, Jupiter has 67 moons. There’s an awful lot of stuff up there, and we can’t see most of it! Tuesday was our first Druridge Bay Discover Stargazing session and six enthusiastic participants enjoyed views of the Milky Way, the Plough, Cassiopeia, Arcturus, Cygnus, plenty of satellites, and even naked-eye views of the Andromeda Galaxy – 2.5 million light years away, and heading towards us at more than 100 km/s, but light travels at 299792458 m/s so we don’t have to worry about it just yet 😉 Probably the most interesting observation was of a satellite crossing the sky from east to west, almost as bright as the ISS.